The colours emerge from the depth of the image. One of the great stories of the modern painting is about the liberation of the colour from the object represented, and the development of its own materiality. This story had its heyday in Europe in the mid-20th century. Back then, Jean Dubuffet, Jean Fautrier and Emil Schumacher mixed colours with sand, plaster and other compact materials, and in USA, Jackson Pollock and Morris Louis let the paint drip onto and run down the canvas. Markus Linnenbrink still finds new facets in the colour as a material even in today's digital age. With the colourful luminosity of his images, the Dortmund-born artist, who has been living in New York for several years, is closer to the American tradition while at the same time, his approach follows the European experimentation with materials. What the artist applies to different types of panels, primarily wood, is in fact neither oil nor paint. He uses special pigments mixed with epoxy resin or wax, thus creating a more or less liquid substance that runs over the surface in straight or amorphous fields. Thus, Linnenbrink elicits from the colour as matter and material a dazzling variety of individual colours, which he can achieve through different admixtures. But it does not stop there. The coloured material, hardened into a solid substance several inches thick, is processed further in an almost sculptural manner. 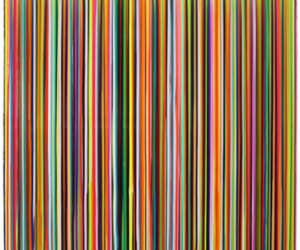 With an either hand-held or digitally guided drill, the artist drills vertical or diagonal, straight parallel furrows in the existing layers of paint so that additional, surprising constellations of colour and form emerge. Thus, in Linnenbrink’s hands, the traditional panel becomes a relief or even a large-scale sculpture. On the other hand, his painting comes back into view when he works directly in the room or on the wall. 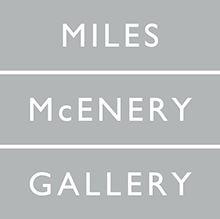 The entrance of the gallery is dominated by a black-and-white, more or less transparent image, about which the artist himself says that it resembles a black-and-white photograph of his painting. Indeed, the photographic image of a painting always lets the colours down. But even a colour photo makes the surface profile of a painting almost disappear, so that it is only discernible in the most skillful lighting. Nowadays, even the finest structures and profiles of the material can be rendered in computer-generated reproductions. Markus Linnenbrink is aware of these possibilities. His also technically innovative renewal of painting responds consciously to the challenges of the advanced digital age, and cracks them, so to speak, again with analogue means. Even the best digital illustration only gives us a hint of the optical and physical sensations which Linnenbrink’s works offer. Ultimately, what counts is the experience there and then, and thus the aura of the original, so often mistakenly declared dead.